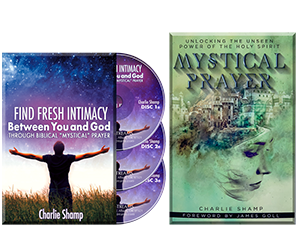 Charlie Shamp "Finding Fresh Intimacy Between God and YOU — through Biblical 'Mystical' Prayer"
We really enjoyed our time with Charlie Shamp on-set at Elijah Streams. He is full of prophetic revelation that will stir up the gifts that are available to you! In this episode, Charlie dives right into how MIRACLES HAPPEN and how he started hearing from God in a much deeper and higher way. He has seen many signs and wonders break out in the nations, and he prays for our viewers to see the same working of miracles and more! On this episode, Charlie Shamp will help you to earnestly desire the gifts! After watching Charlie Shamp's episode, I encourage you to go further and grab hold of this exciting and new package we've put together just for you, our Elijah Streams viewer. To view and order those products click here. HOW TO Storm the gates of Heaven with the kind of prayers that God LOVES! Why Some Mystical Prayers SEEM TO Erase the Barrier between You and God. 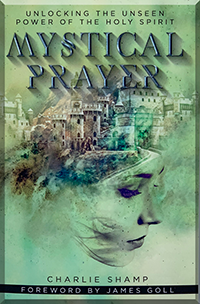 How to practice Biblical Mystical Prayers – INCLUDING LEARNING the FOUR Steps Every Believer Should Practice. Discover a prayer life that erases all barriers between you and God. In this new year, why not get yourself equipped and empowered for the MORE God wants to give you! Call NOW to order Charlie Shamp's BOOK, PLUS this exclusive THREE-CD set called, "FIND FRESH Intimacy Between God and YOU — through Biblical 'Mystical' Prayer"
In this EXCLUSIVE PACKAGE — not only will you receive Charlie Shamp's book Mystical Prayer—but IN ADDITION, you'll receive a complete TEACHING set including THREE instructional audio CDs in which you'll learn the Four Steps Every Believer Should Practice — to experience the Reality of Heaven—IN YOUR LIFE — NOW — a true intimacy with God, through Mystical Prayer. You'll learn how to walk with God in a much deeper and intimate way than you ever knew was possible -- AND YOU'LL discover a prayer life that erases all barriers between you and God. Are you excited by the POSSIBILITIES?